STEBEL, K. , CHOINSKI, D.
Proper operation of control systems is essential for achieving good economic results and reducing control effort. The paper is focused on presenting a new application of a well-known concept. The main scope of the paper is a practical presentation of obtaining a minimum process performance index by means of known statistical tools. This is achievable by appropriate selection of the correction value for set-point and the width of the time window of a statistical algorithm. The proposed novel algorithm was successfully implemented in the pilot neutralization process. On one hand, the proposed algorithm is a corrector of the statistical properties of the control error, and, on the other one, of a set point of the control system. Q. Li, Whiteley, J. Rhinehart, "An automated performance monitor for process controllers," Control Engineering Practice, vol. 12, pp. 537-553, 2004. S. A. Zahiripour, A. A. Jalali, "A novel adaptive switching function on fault tolerable sliding mode control for uncertain stochastic systems," ISA Transactions, vol. 53, no 5, pp. 1528-1533, 2014. R-E. Precup, S. Preitl, M-B. 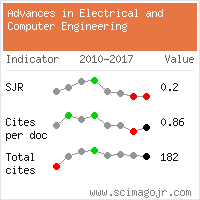 Radac, E. M. Petriu, C-A Dragos¸ J. K. Tar, "Experiment-Based Teaching in Advanced Control Engineering," IEEE Transactions On Education, vol. 54, no. 3, pp. 345-355, 2011. P. Skupin, D. Choinski, "Microactuator System for Teaching Micropositioning Control System Design," International Journal of Engineering Education, vol. 30(6A), pp.1499-1508, 2014. Q. B. Jin, Q. Liu, "IMC-PID design based on model matching approach and closed-loop shaping," ISA Transactions vol. 53, pp. 462-473, 2014. A. Besancon-Voda, "Iterative auto-calibration of digital controllers: methodology and applications," Control Engineering Practice vol. 6, pp. 345-358, 1998. 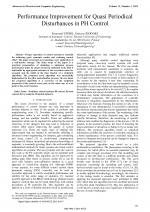 V. J. Ginter, J. K. Pieper, "Robust Gain Scheduled Control of a Hydrokinetic Turbine," IEEE Transactions On Control Systems Technology, vol. 19, no. 4, pp. 805-817, 2011. K. Stebel, J. Czeczot, P. Laszczyk, "General tuning procedure for the nonlinear balance-based adaptive controller," International Journal of Control, vol. 87, no 1, pp. 76-89, 2014. T. Klopot, P. Laszczyk, K. Stebel, J. Czeczot, "Flexible function block implementation of the balance-based adaptive controller as the potential alternative for PID-based industrial applications," Transactions of the Institute of Measurement and Control, vol. 36, no. 8, pp.1098-1113, 2014. T. Hagglund, "Industrial implementation of on-line performance monitoring tools," Control Engineering Practice vol.13, pp.1383-1390 2005. A. Kozyra, J. Wiora, A. Wiora, "Calibration of potentiometric sensor arrays with a reduced number of standard," Talanta, vol. 98, pp. 28-33, 2012. T. Hagglund, "A control-loop performance monitor," Control Engineering Practice, vol. 3 no. 11, pp.1543-1551, 1995. K. Patanarapeelert, T. Frank, R. Friedrich, P. Beek, I. Tang, "A data analysis method for identifying deterministic components od stable and unstable time-delayed systems with colored noise," Physics Letters A, vol. 360, pp. 190-198, 2006. J. Bhattacharya, E. Pereda, H. Petsche, "Effective Detection of Coupling in Short and Noisy Bivariate Data," IEEE Transactions on Systems, Mam, and Cybernetics- part B: Cybernetics, vol. 33, no. 1, pp. 85-95, 2003. Y. Wang, T. Liu, Z. Zhao, "Advanced PI control with simple learning set-point design: Application on batch processes and robust stability analysis," Chemical Engineering Science vol. 71, pp. 153-165, 2012. K. Stebel, M. Metzger, "Distributed parameter model for pH process including distributed continuous and discrete reactant feed," Computers and Chemical Engineering vol. 38 pp. 82- 93, 2012. T. J. McAvoy, "Time Optimal Ziegler-Nichols Control," Ind. Eng. Chem. Process Des. Develop, vol. 11, no. 1, 1972. S. Mahuli, R. Rhinehart, J. Riggs. "Experimental demonstration of non-linear model-based in-line control of pH," J. Proc. Cont., vol 2, no 3, pp.145-153, 1992. T. K. Gustafsson , B. O. Skrifvars , K. V. Sandstroem , K. V. Waller, "Modeling of pH for Control," Ind. Eng. Chem. Res., vol. 34, pp. 820-827, 1995. K. Stebel, J. Czeczot, "Nostationary modelling approaches of neutralization process for model-based control," 14th IEEE International Conference on Methods and Models in Automation and Robotics MMAR 2009, Poland 2009. S. Rubio, B. Jørgensen, G. Jonsson, "pH control structure design for a periodically operated membrane separation process," Computers and Chemical Engineering, Vol. 43, pp. 120- 129, 2012. K. Stebel, D. Choinski, "Programmable pH measurement correction in application to control," Proceedings of IFAC Workshop on Programmable Devices and Systems PDS 2004, Cracow, Poland, pp.47-52, 2004. K. Stebel, D. Choinski, "Context Model for Multi-Agent System Reconfiguration," AIMSA 2008, LNAI 5253, pp. 1-11. Springer-Verlag Berlin Heidelberg, 2008. M. Metzger, D. Choinski, "Neutralization pilot plant," Activity report 1999-2000, Institute of Automatic Control, Silesian University of Technology, Gliwice, Poland, pp.67-69, 2001. I. Leito, L. Strauss, E. Koort, V. Pihl, "Estimation of uncertainty in routine pH measurement," Springer-Verlag Accred Qual Assur, vol 7: pp.242-249, 2002. G. Meinrath, P. Spitzer, "Uncertainties in Determination of pH," Springer-Verlag Mikrochim. Acta, vol. 135, pp.155-168 2000. P. Brandstetter, T. Krecek, "Speed and Current Control of Permanent Magnet Synchronous Motor Drive Using IMC Controllers," Advances in Electrical and Computer Engineering vol. 12, no 4, 2012. V. G. Dovm, A. D. Borghi, "Rectification of flow measurements in continuous processes subject to fluctuations," Chemical Engineering Science vol. 56, pp. 2851-2857, 2001. J. G. Ziegler, N. B. Nichols, "Optimum settings for automatic controllers," Transactions of the A.S.M.E. vol. 42, pp. 759-765, 1942. K. L. Chien, J. A. Hornes, J. B. Reswick, "On the automatic control of the generalized passive systems," Trans. Assoc. Soc. Mech. Eng. 1952. D. Choinski, K. Stebel, W. Nocon, "Detection of Measurement Deviation in Application to Oxygen Level Control," 12th IEEE International Conference on "Methods and Models in Automation and Robotics", Poland, vol. 1, pp. 387-392 , 2006. Citations for references updated on 2019-04-22 08:56 in 149 seconds. Website conception, design and maintenance by Eugen COCA. Content updated on 28 Feb 2019. Site engine updated on 28 Feb 2019. This page was generated on the server in 0.078 seconds and loaded in your browser in > seconds.